Drum Shield- DS6D Six 2ft. x 5 ft. Panels w/ Deflectors DS6D Drum shield Six section drum shield, drum screens or drum shields Items included in your purchase. 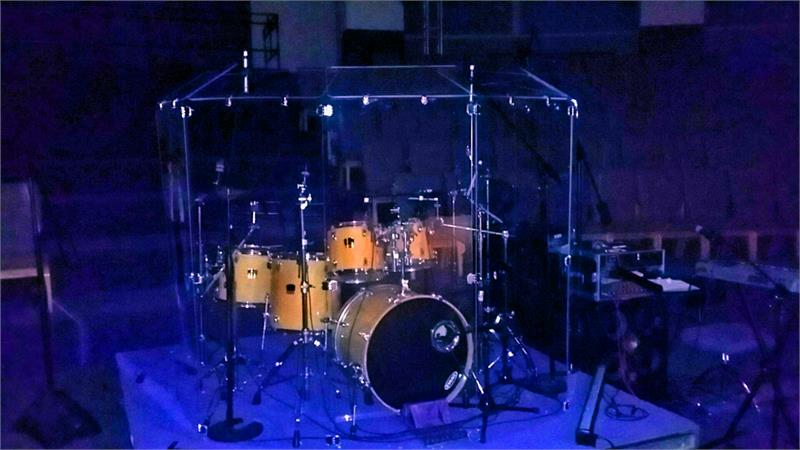 6 panels Full 1/4" x 24 x 60 Crystal clear acrylic + 6 deflector panels 12" x 24"
DS6D Drum shield Six section drum shield, drum screens or drum shields Items included in your purchase. 6 panels Full 1/4" x 24 x 60 Crystal clear acrylic & 6 deflector panels 12" x 24" Crystal clear acrylic 15 Bright Chrome Hinges or Living Hinge which easily attach and hold panels tightly. 12 deflector panel holders. Total Height With Deflectors 6 ft. With easy assembly instructions. Welcome to our drum shields & custom Acrylic drum shield and drum screen panels, for Drum sets, Drum kits and drum n bass. We take great pride in these drum shield enclosures and the quality of their construction. With 15 years of custom fabrication in the plastics industry behind us, we can construct any possible enclosure for your drum sets, drum kits, drum and bass, or any type of sound or noise that you need to control. ZOAR CHURCH RD SALEMBURG NC 283585 NORTHA CAITHLABRANDON BUTLER 9109901575 SANTA CHISRTANAS NOITH PLE DRUM SHIELD D56D SIX 2FT X DT PANELS W DRUM SHIELDS DENNZOI DISPAY CO.
We ordered two of these units sight unseen for an install. Having never ordered from Pennzoni before, I called and talked with Nancy, who was very nice and helpful. Went ahead and placed the order online and noticed an issue with shipping. Called her back, she told me she'd take care of it when she got the order. Completed the order and shortly received a confirmation email and right behind that another that reflected the correct shipping. Needing them quickly and already being late in the day, they shipped out the next morning as promised. We received then on time and found them to be a superior product then what we had been ordering, yet still the same low price. Easy to put together with the metal hinges, as well as some extra hinges in the package which came in very handy since we were putting both of these around one large drum kit. One other thing which may not seem big but is a huge time saver, the protective covering peels off with ease versus the "other" guys product which was like pulling teeth to get it off. Thanks Pennzoni and thank you Nancy... We'll be ordering from you guys from now on.